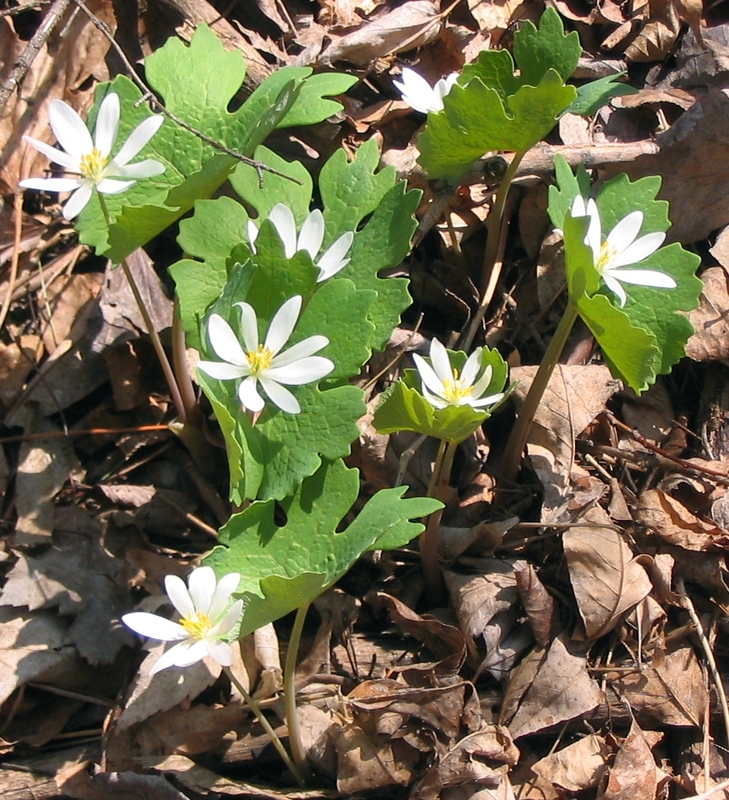 The bloodroot (Sanquinaria canadensis) are just beginning to bloom along the road in a wooded depression. Their fat palm-shaped leaves emerge from the ground furled in tight spears, and their blooms spring up not much higher than six inches. These small native glories of the spring also make wonderful garden plants. I have some that I purchases a few years ago in my woodland garden. They are starting to spread. I think I’ll buy more to help them along the way. If you decide you want some, just be sure that you buy your rootstock from a reliable nursery and don’t dig them out of the wild. According to Armitage’s Herbaceous Perennial Plants the rootstock has a yellowish-red sap when cut. He says, “The sap was used by the Indians as a dye for coloring and war paint(517).” That’s interesting, isn’t it? They are very hardy plants but ephemeral in that the foliage dies back in summer. Shade is important, as is springtime moisture. They can be divided after their blooms have died off, but I still think I’ll just buy some more. Armitage, Allan. Herbaceous Perennial Plants. Varsity Press, Inc. Georgia. 1989.